Playful Learning Literacy Games for Preschool and Kindergarten! This week The Early Childhood Education Team is offering tips and suggestions to help young children learn the ABC’s! Whether you are a teacher, a childcare provider, or a parent teaching your own child at home, you’ll find valuable resources to encourage early literacy, letter awareness, and promote playful learning at home or in the classroom! Early Literacy to Try at Home! Parents are a child’s first teacher! Some parents may not even be aware of how daily interactions with their children are teaching letter recognition and awareness. Letter awareness and general literacy begins even in infancy. Listening to stories, looking at printed words in books, pointing out the names of common household items, and listening or vocalizing to music will create wonderful opportunities for young children to become aware of print, sounds, letters, and words. Disclosure: this post and others on this blog contain affiliate or distributor links. All opinions are our own. Read to your children daily and have books available that are age appropriate (cloth books and board books are best for very young children as they are durable). Try singing or saying letters and the sounds they make – even infants will try to vocalize the early sounds! Don’t worry that your singing voice may not be the best. Young children don’t care about the quality of our singing voices, they just want to hear YOU! Label household items and/or say the beginning letter and sound that item makes. For example, say the word EGG and the sound the letter E makes in the word (it may feel a bit awkward at first, but soon it will simply become a part of normal routines). Place beginning letter labels on common items (like the Refrigerator). Post-it brand notes work well for easy labeling and removal. Through intentional, yet simple, daily engagement and interactions, young children develop an awareness of sounds/letters and will soon be ready to begin activities that promote letter recognition, sounds, and early words through playful learning. PLAYFUL LEARNING LITERACY ACTIVITIES for PRESCHOOL and KINDERGARTEN! 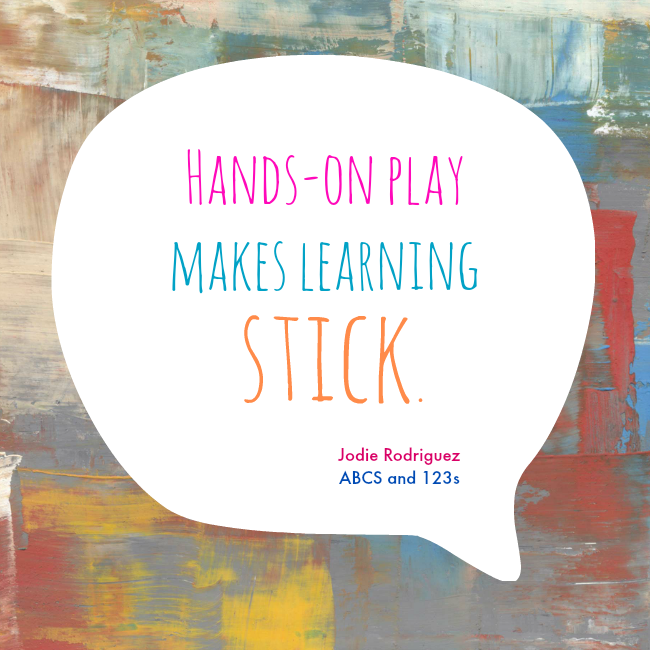 Learning through play is crucial in preschool and kindergarten. When presented with opportunities to learn through play, children will naturally absorb information that they can apply to their everyday world. 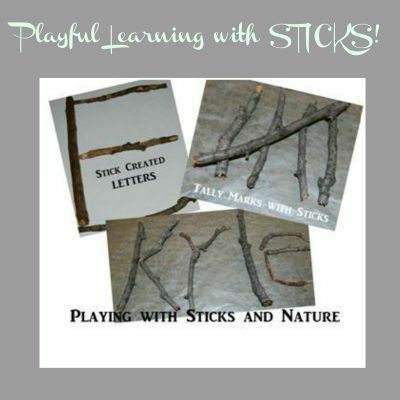 Playful Learning with Sticks – the letters in a child’s name (and those of family members) are some of the first letters preschoolers will use daily. Take learning OUTSIDE for playful FUN! Rock Words and Letters – use chalk on rocks for intentional play with nature! 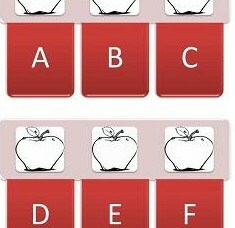 Apple Stamping Alphabet – a seasonal printable alphabet with playful learning suggestions. Gingerbread Alphabet/Picture Matching – a printable picture/alphabet matching game. Chalk Dust Feather Writing – transfer letters with non-traditional writing tools (pre-writing/writing). Textured Sensory Name Train – create letters for names with textures – free printable TRAIN for sensory letter play. Orchard Playdough Mats Letter Printing – free tree mats with playful learning suggestions and activities. Sugar Sensory Letter Trays – writing letters in a sugar tray is FUN practice for letter recognition and writing skills. Ocean-themed Alphabet Discovery Bottles – shake, look, and record letters found in a sensory bottle. Creating a Graphic Alphabet – create items that BEGIN with a letter of the alphabet! Suggestions for items that correspond to each letter. Band-aid Letter Matching – capture preschoolers love of band-aids and play with letter matching. Braille Alphabet – expose young children to a sensory alphabet through tactile and sensory play! Wet Chalk Kites – learn letters, names, and early words with a free printable for kite bow games. Created Beginning Letters – free printable to explore the creation of the beginning letters for early words. Magnifying Glass Letter Scavenger Hunt – use a created magnifying glass to hunt for letters in favorite books! Christmas Sensory Name Train – tactile created letters for a name train in preschool and kindergarten. Valentine Sugar Sensory Tray – a sugar tray for sensory alphabet stamping. 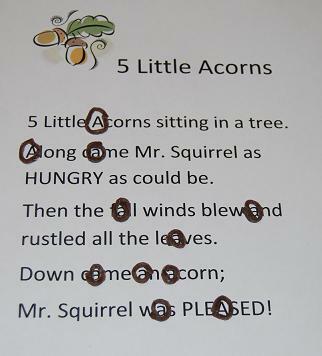 5 Little Acorns – locate and circle the beginning letter after reading a FUN FALL POEM for kids! Popcorn Sight Words Free Printable – explore basic sight words with this free printable popcorn game. Harvest Letter Clipping Cards – printable cards for seasonal play with letters and words. Pumpkin Sight Words and Pumpkin Letter Tiles – practice letters and sight words in seasonal printable for playful learning at home or in the classroom. Pilgrim Feathers for Letter Matching – free printable feathers for letter matching. Additional game and activity suggestions are offered for preschool and kindergarten. 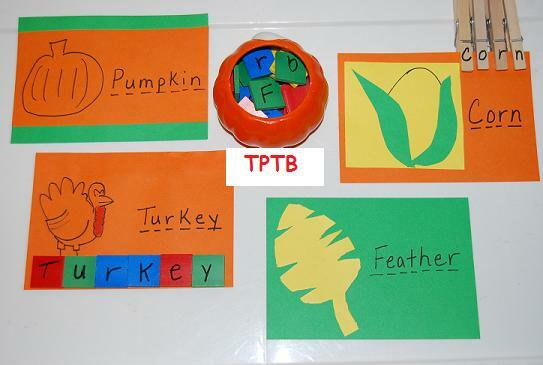 Thanksgiving Letter Matching – a free printable seasonal letter game. Christmas Words Letter Clipping – Clip letters with clothespins that correspond to seasonal words. Candy Cane Sight Words – a free printable for seasonal play with words and letters. Mitten Matching – printable mittens and game/activity suggestions for matching in preschool and kindergarten. Snowman Word Families – explore missing letters and word families with a free snowman printable. 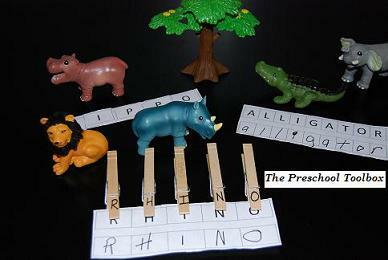 Zoo Animal Letter Clipping – play with clothespins and clip corresponding letters for favorite zoo animals. Ice Cream Cone Letter Match – match “scoops” of ice cream labeled with letters. Free printable for words/letters/sight words and activity suggestions. 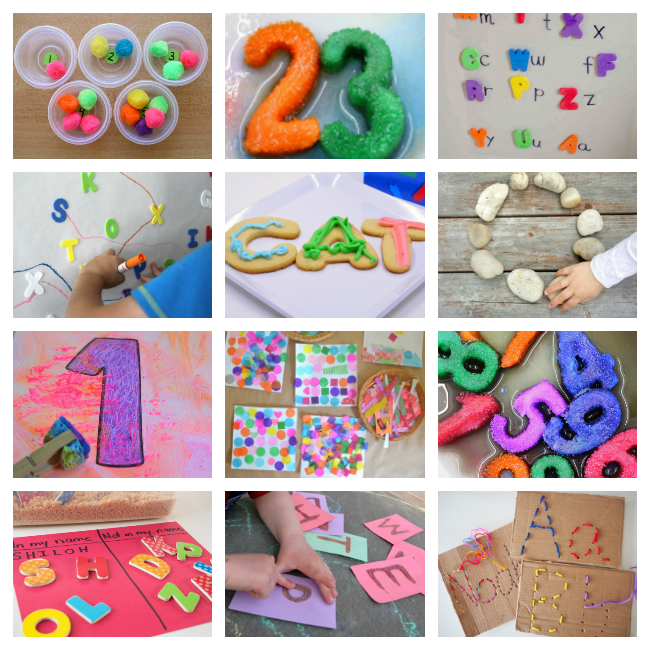 For MORE ways to learn and play with ABC’s, please visit the wonderful activities offered by the dedicated Early Childhood Education Team – #TeachECE offers great resources for use at home or in the classroom! 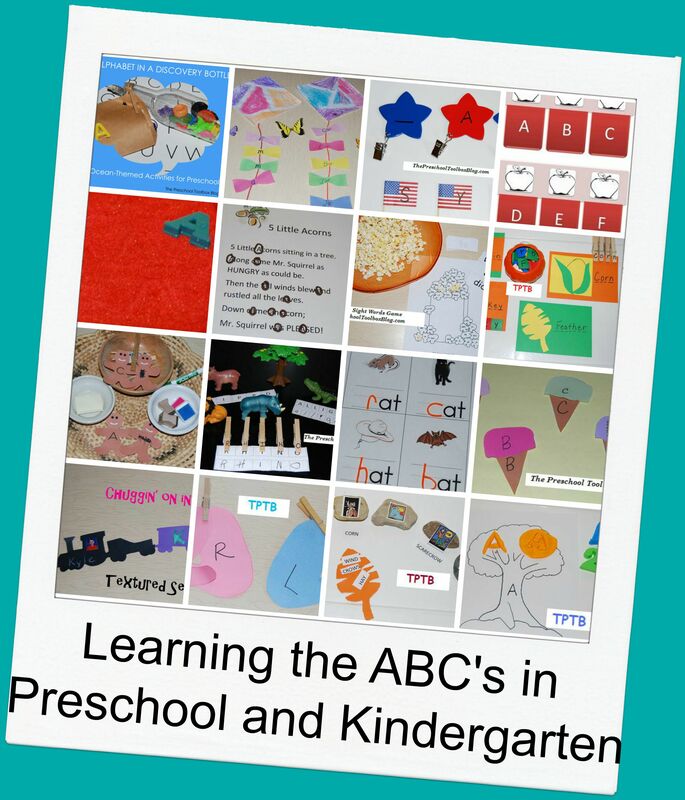 For even more ways to introduce the ABC’s and 123’s to preschoolers, see our collaborative book: ABC’s and 123’s. So many great ways to teach the alphabet. We have recently just started playing with rocks and words. Wow! What a great resource! Oh goodness, SO many great ideas here! I will be going through them all! Thanks! So many great resources. We love the stick activity. WHOA! So many ideas – I’m in back to school planning mode, so these are perfect. LOVE the train name!!! You have so many great ideas! Pinned. I also pinned your name train to my Everything Trains board. Thank you!